Let the Give You Rest LuxLeather Journal inspire you to come to the Lord with all your prayers, sorrows, praises, and more. The theme of this LuxLeather journal is Matthew 11:28, which calls His children to lean on Him, especially when we are going through a season of difficulty. The Lord desires that we come to Him and let Him carry some of the burden so that we may rest in Him. Each time you open the Give You Rest LuxLeather Journal, it will remind you of the Lord's promise as you depend on Him to lighten your load. 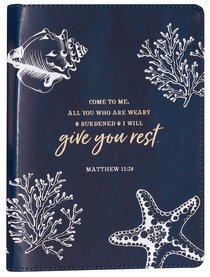 The cover of the navy Matthew 11:28 Journal is made of LuxLeather, and features Matthew 11:28 in gold-foiled text with a seashell design. It provides a relaxing coastal image. Also comes with a ribbon marker for marking one's place. About "Journal Slimline: Give You Rest Collection, Navy/White Luxleather (Matthew 11:28)"